Why is the IoT important? Internet connectivity means that today’s customer has instant access to information on any topic at any time and in astonishing amounts. The ability of devices to connect to one another has completely changed how information is exchanged and the rate at which this happens. The IoT has implications across the broader marketplace and in every field of innovation. Buyer/seller relationships have been revolutionized by the giving and receiving of data, which in turn has shaped how companies make decisions around marketing and new product development. The IoT is also supporting innovations in healthcare with the development of “smart” medical devices like handheld ultrasounds that can deliver patient information directly into a database, speeding up the diagnostic process so patients get treated faster. Furthermore, IoT connectivity is changing workplaces as companies shift increasingly toward the use of AI and connected devices to cover menial tasks and streamline workflows, including digital assistants like Amazon’s Alexa or the Google Assistant. In short, the IoT is changing everything in every market - and the movement shows no sign of slowing down. As a product developer, you might be losing ground if you are not capitalizing on the IoT and the ever-increasing field of opportunity that it affords. Why is iOT in garages and why do consumers need it? Garage door openers have been around for a long time. The first electric overhead garage door opener was developed in 1926 but didn’t become popular for use until after the second world war with the additional development of electric keypads. Since then, further functionalities have slowly emerged including wireless technology, key chain remotes, and fingerprint activated keypads. Most recently, IoT connectivity has opened up new possibilities including the ability for home owners to open their garage door via the Internet to admit visitors or deliveries. There’s no doubt that home automation is a lucrative industry, but while being an exciting field it also carries implications for developers looking to minimize risk. Product malfunctions are often attached to security issues and can prove exceptionally costly. A garage door is often the heaviest moving part of a house, which means that serious malfunctions can be dangerous. Additionally, it can be an important element of overall home security. IoT connectivity can help product developers address some of these considerations by enhancing product quality and functionality, and helping prevent safety hazards and mechanical damage. Mighty Mule (a division of Nortek Security & Control) approached Ideaz with a seemingly impossible task - design an entire line of do-it-yourself Smart garage door openers and controllers in an extremely short timeframe. As the developer of the world’s first wireless garage door opener and holding a long tradition of innovation and manufacturing excellence, NSC wanted to develop the line in a very short period of time without compromising reliability and quality. With a strategic channel partner identified and a design language defined, we set out to design a line of IoT connected garage door openers and controllers that allow users to control all aspects of door control and security. To maximize the ROI and minimize tooling costs, the tooling for the garage door opener housings were designed to be modular and have the ability to create 3 different SKUs from a single tool. The openers are all app connected and remotely operable, offering remote entry and garage monitoring from anywhere. The unit features a DC motor designed for smooth, quiet operation. A separately purchased smart wall station easily connects the opener to any smartphone. 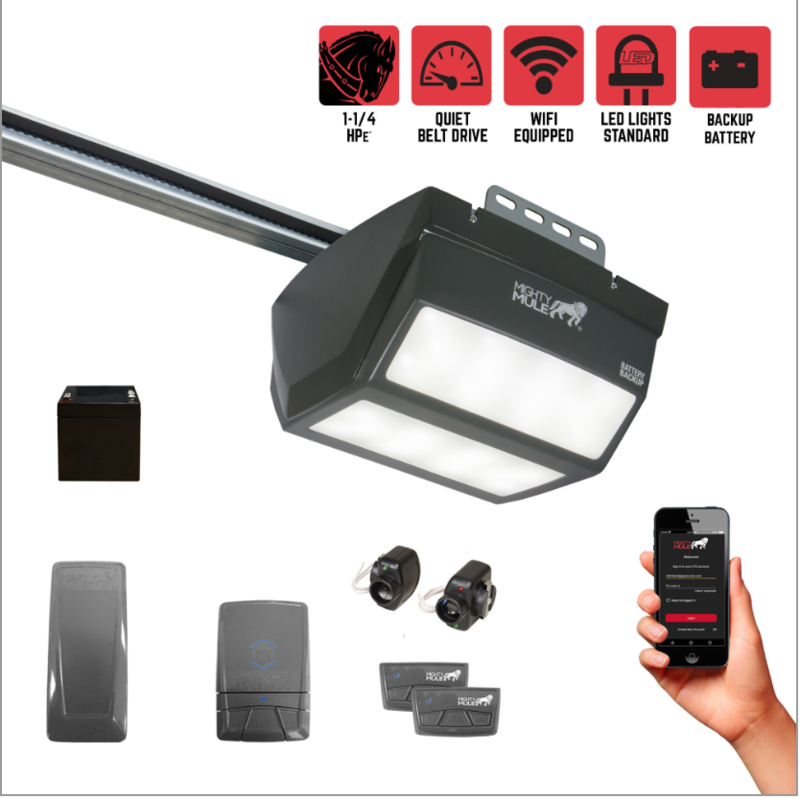 In addition, Mighty Mule offers a lifetime warranty on the motor, the LED lighting on the keypad, and the steel reinforced belt, as well as supplying free technical support. By streamlining the production cycle and minimizing costs using modular design, Ideaz was able to develop an iOT garage door opener for Mighty Mule that the company was able to confidently back with a lifetime warranty.